As New Yorkers, we tend to think that the South moves at a different (read: slower) pace. But if that’s how the craftsmen and women of the region cultivate such skill and create such beautiful work, then we’re all for it. This year, we explored Charleston, South Carolina to find the best of the city’s food, drink, art, and design. 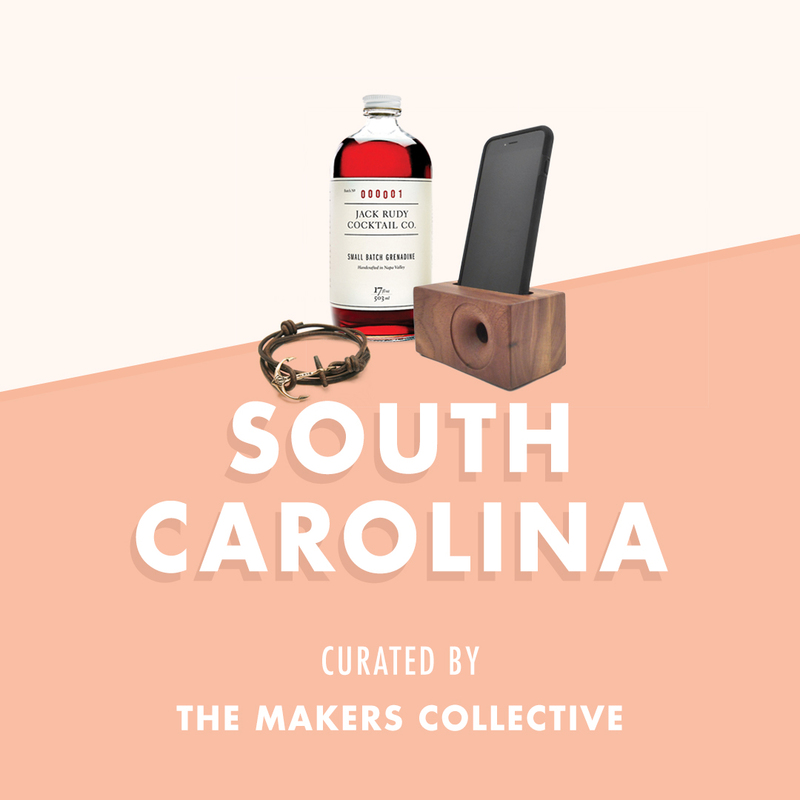 With the holidays here, we tapped South Carolina's The Makers Collective to help us bring you gift ideas from the makers, designers, and foodies enriching the Palmetto. The collective works with entrepreneurs, small businesses, and artists to bring their work to a wider audience through events like the Indie Craft Parade and annual Makers Summit. From small-batch cocktail ingredients for at-home happy hours to raw denim jeans that will impress on any night out (and feel amazing for years), below are their top ten recommendations for how to give a little of South Carolina. "If you want stuffed animals with loads of character, you’re looking for a Fink Toy. Even the horses, rodents and alligators are irresistibly cuddly." "Ink Meets Paper is our go-to stationer. They print beautiful letterpress greeting cards for every occasion on their vintage Chandler & Price press." "Rustic materials, cast metal, and leather are used to create beautiful nautical-themed, unisex pieces that make for unique jewelry gifts." "This classic French-style rolling pin is available in several types of wood and makes a great gift for every food lover on your list." "We love these beautifully packaged, small-batch cocktail ingredients. The products are delicious and make your bar look good in the process." "These tees and stickers feature illustrated versions of key landmarks across the country, all designed and printed by outdoor enthusiasts." "These pieces are a great combination of elegant metals and natural shapes. They’re elegant and timeless." "These wooden speakers fit any version of the iPhone and are a win because they seamlessly merge old and new technology." "Custom jeans from U.S.-manufactured raw denim, all made on-site at the Greenville store." "Candlefish offers a literal library of scents through their candles. If you have a chance to visit the store, they also offer a candle making class."